This little guy demonstrates his weave pole style. Consider taking up dog agility if you enjoy competition, love having fun with your dog and want a little exercise for yourself and the pooch. Prepare yourself and Fido by taking classes at a local agility club. No matter how you do competitively, you'll build your bond with your pet. If you have a talented mutt, he can compete in agility, although not in events sponsored by the American Kennel Club. The United States Dog Agility Association allows mixed-breeds in their competitions, as do other organizations. Your dog must be registered with the sponsoring organization to participate. Agility is a sport whereby dogs negotiate a variety of obstacles in a specific order in a judged class. Depending on experience level, challenges include weave poles, tunnels, see-saws, jumps, a pause table, a tire jump, a broad jump and other tasks. You direct your dog along the proper course. You can walk the course before the start of the event, but you can't bring your dog with you. During the class, the rules allow you to guide your dog via voice and signals, but you can't touch the obstacles or the animal. No outside assistance -- people calling from ringside -- is permitted. If the jumps for an agility trial reminds you of a miniature horse show course, that's not a coincidence. The sport was originally modeled on show jumping. Like that equestrian endeavor, agility is judged on time and faults. Each course has a standard time for completion, with time faults added for every second the dog exceeds the time. Dogs incur penalty faults for performing incorrect actions. The dog with the least amount of faults wins. In case of a tie, the dog with the fastest time wins. AKC dog agility consists of three levels, with canines working their way up. All dogs start out in Novice level and face 14 to 16 obstacles. In this phase, dogs learn navigation with limited handler input. Once they've passed the novice level, they move on to Open level, with up to 18 obstacles. Courses are more difficult, and dogs need more handler guidance. Dogs then move up to the Excellent level, with up to 20 obstacles of greater challenge. 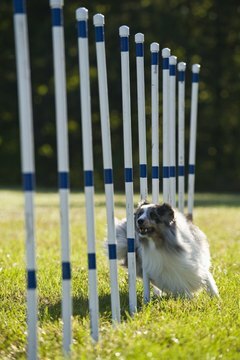 Other organizations may use different terms for agility levels -- such as beginner, elementary, intermediate and senior. The height of the jumps your pup must leap depends upon his size. It also depends on the level and association in which your dog competes. For example, the USDAA offers a recreational performance program that is less competitive than its championship division. A small dog 12 inches at the shoulder must jump 8 inches in the performance division and 12 inches in the championship section. That same dog competing in the AKC's regular class would compete in the 12-inch-jump division but would compete against dogs with height between 11 and 14 inches. Your dog will be measured by an agility official and receive a jump height card. Other AKC jump heights include the 16-inch class for dogs over 14 and up to 18 inches at the shoulder; the 20-inch class for dogs over 18 and up to 22 inches at the shoulder; and the 24-inch class for dogs over 22 inches at the shoulder. For the 26-inch class, the AKC allows entrance at the owner's discretion. The AKC states that dogs may "jump in a jump height class higher than his/her shoulder measurement, but never lower." Although some rules might vary according to the organization, certain canines cannot compete in agility trials. These include female dogs in heat, pregnant or nursing dogs, lame or blind canines, and sick animals or those with bandages or other evidence of recuperation from injury. Dogs who show aggression to other canines or people are not permitted. Depending on the animal's breed, a dog might not be eligible to compete until reaching the age of 1 year or 18 months. How Old Are Huskies When They Start Shedding?